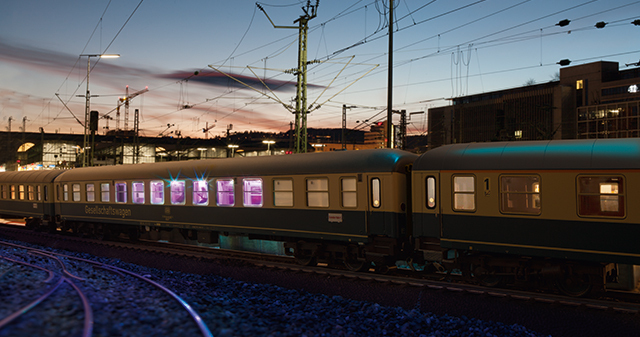 Prototype: German Federal Railroad (DB) type WGmh 824 entertainment car. Paint scheme in ocean blue / ivory. The car looks as it did in the summer of 1985. Model: The car has a digital decoder. The sound functions come via a microSD card. The car has factory-installed interior lighting that can be controlled digitally. The bar lighting can be controlled digitally. Warm white LEDs are used for the interior lighting and the bar lighting. The light console and the strobe can be controlled separately in digital operation. Different color LEDs are used for the light console. Cold white LEDs are used for the strobe. The speed of the light changes can be controlled with the rotary controller. When the forward direction is selected, the beat depends on the music. When the reverse direction is selected, the beat is independent of the music. An 8 GB microSD card with two license-free songs and five sounds is built into the car. The music and the sounds can be played by means of the function buttons. Two 2.5 to 3 watt speakers provide optimal sound quality. The volume can be changed. The music and the sounds can be swapped out or added to according to your own ideas. The microSD card on the car floor is removed to do this. A conversion program is already stored on the microSD card. A card reader is not included with the car. The car has operating current-conducting couplers that can be controlled digitally. Please pay attention to the instructions for the car. A 9-part set of figures from the firm Preiser is included. Length over the buffers approximately 28.2 cm / 11-1/8". The music and sounds can be swapped out or added to as you desire. 9-part set of figures from Preiser. The figures included with this car may have to be altered in size due to technical circumstances. This model can be found in a DC version in the Trix H0 assortment under item no. 23490. A car set to go with this car can be the item number: 43867. 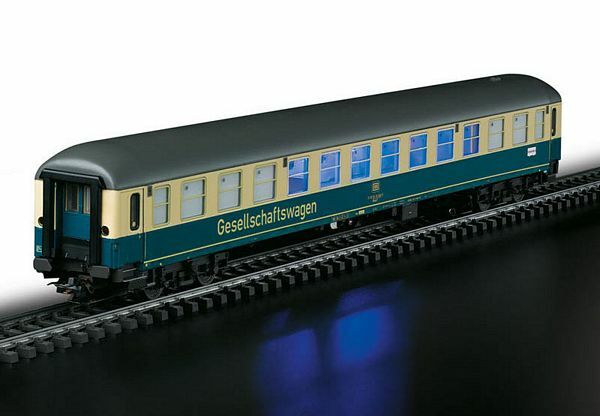 The prototype for this item is the German Federal Railroad (DB) type WGmh 824 entertainment car ("Gesellschaftswagen"). Paint scheme in ocean blue / ivory. The car looks as it did in the summer of 1985. Model: The car has a digital decoder. The sound functions come via a microSD card. The car has factory-installed interior lighting that can be controlled digitally. The bar lighting can be controlled digitally. Warm white LEDs are used for the interior lighting and the bar lighting. The light console and the strobe can be controlled separately in digital operation. Different color LEDs are used for the light console. Cold white LEDs are used for the strobe. The speed of the light changes can be controlled with the rotary controller. When the forward direction is selected, the beat depends on the music. When the reverse direction is selected, the beat is independent of the music. An 8 GB microSD card with two license-free songs and five sounds is built into the car. The music and the sounds can be played by means of the function buttons. Two 2.5 to 3 watt speakers provide optimal sound quality. The volume can be changed. The music and the sounds can be swapped out or added to according to your own ideas. The microSD card on the car floor is removed to do this. A conversion program is already stored on the microSD card. A card reader is not included with the car. The car has operating current-conducting couplers that can be controlled digitally. Please pay attention to the instructions for the car. A 9-part set of figures from the firm Preiser is included. Length over the buffers approximately 28.2 cm / 11-1/8". Pure Disco: You can now dance into the morning to hot disco rhythms with realistic disco feeling such as a light console, changing lights, or a strobe. The special showstopper – with the microSD card included with this car you can store your own favorite songs and play them when you want – just like a DJ on party night. History: In 1976 the German Federal Railroad placed the prototype (car number 51 80 89-80 600-5) of a new, comfortable generation of entertainment cars into service. These type WGmh 824 cars were planned to set new standards for the highest level of comfort in relation to adventure trips, rolling conferences, or excursion trips. At one end of the car was two compartments for train officials as well as a toilet, at the other end a galley with an adjoining bar. One of the two compartments for train officials served as a technology space with music equipment and control of the lighting installation. Approximately two thirds of the car was planned as entertainment space and could be used as a dining room, conference room, or dance area. Only one small seating corner was permanently installed at one end of this space. Otherwise, the interior could be arranged to meet the requirements of the occasion. Themes from cities in Lower Saxony decorated the side walls of the entertainment space. The bulkhead walls by contrast had an intertwined pattern in different colors. The car ran on Minden-Deutz type 36 trucks and was rated for 160 km/h / 100 mph. Its underframe was built in the customary manner with a frame, cross members, and plates constructed of steel. Its car body was a welded design with side walls, end walls, and roof plates. However, cross bracing had to be installed to accommodate extreme variations in the load under certain circumstances (such as during dance events) in the entertainment area. Right from the time it was placed into service, the entertainment car ran in the DB standard paint scheme of ocean blue / ivory that was current at that time.